The gift certificates can be redeemed for all items in our shop. Perfect as a present! After order and payment the voucher code is sent out to you via e-mail. After that, the code can be used in our shop at the checkout. Unfortunately, we can'T pay back cash, either of the full amount or parts of the amount. If the value of the ordered goods is less than the value of the gift certificate, you will get a new gift certificate with the difference. Gift certificate for bodhran-info, value 10€ (net:8,40€). Delivery via e-mail. Gift certificate for bodhran-info, value 20€ (net:16,81€). Delivery via e-mail. Gift certificate for bodhran-info, value 30€ (net:25,21€). Delivery via e-mail. Gift certificate for bodhran-info, value 50€ (net:42,02€). Delivery via e-mail. Gift certificate for bodhran-info, value 75€ (net:63,03€). Delivery via e-mail. 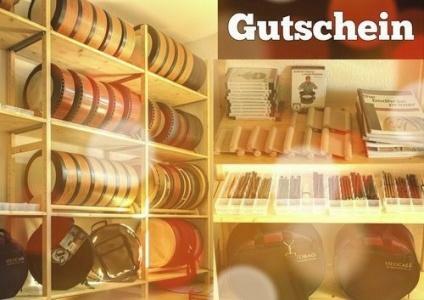 Gift certificate for bodhran-info, value 100€ (net:84,03€). Delivery via e-mail.